Thread: Generals who also carried rifles. I was intrigued by seeing a video of General von Seydlitz-Kurzbach, which described him as a soldier who carried a rifle with him while in the combat zone. It is said that his men greatly respected him for this, figuring that this man meant business and wouldn't hesitate to join them on the firing line. I know that American General Jim Gavin also carried a rife with him, the venerable M-1 Garand and used it to great effect during the invasion of Sicily. During the initial invasion, he was only able to find at first a few other soldiers to band with and they encountered the enemy on a few occasions. Meanwhile, on the other side of the planet, General Jonathan Wrainright was also said to have carried a rifle, using it to help fight on the Bataan Penninsula. This made me wonder, have any other Generals carried rifles during their times in the battle zones, or were the three I just mentioned the only ones? Re: Generals who also carried rifles. I would expect "Viniger" Joe Stillwell would have, he appears to have been that kind of guy. It would mostly have been airbourne troops such as Sosabowski, who by the nature of their work might actually find themselves in close combat. Frankly, the job of a General is NOT to be shooting at the enemy, but to command his men while they do so. Carrying a rifle in these circumstances is a positive menace, as they might be tempted to do just that and neglect their primary role. General Rudolf von Bünau did not carry a rifle but a hand grenade when he was local battle commander of Vienna...but what could you do being a German general in April 1945...? Flamethrowerguy, correct me if I am wrong, but I guess the greanade was not so much for fighting, but more for himself, no? One can read often in Soviet memoirs that Soviet soldiers would reserve a hand grenade for the same purpose. One reason officers and not just Generals carried long arms especially near the front line was so they were not marked out as much from the rest of the men. Snipers etc prefer targeting Officers. A long arm helps them blend in. Of course the entourage would invariably still look like Staff officers but at least the General would blend in a bit lol. This could of course be a possibility. In Bünau's case however I'd call it a cheap way out for a general who commanded divisions and later corps on the German Eastern Front from 1941 to the very end. Btw, his son, Rudolf Jr., also a Knight's Cross holder and captain in an armoured recce battalion, was KIA in 1943 near Roslavl. ...When the fate of his division and of the entire German 6th Army was sealed General von Hartmann spoke to his officers: "An officer has to die in combat. I am not going to shoot myself but will sell my skin as expensive as possible." Then he took his rifle and entered the railroad embankment of Stalingrad South in front of the remains of his divsion (3 officers, 7 NCOs and 183 enlisted men) and started firing -standing uprightly and freehand- upon the attacking Soviet soldiers. At 8:00 am he was killed by headshot, with him died Lieutenant Colonel Corduan (commander Infanterie-Regiment 191) and Major Bayerlein (commander Infanterie-Regiment 211). One of Patton's pistols was displayed in the museum at Ft. Knox, it had ivory grips, and looked to be nickle plated. 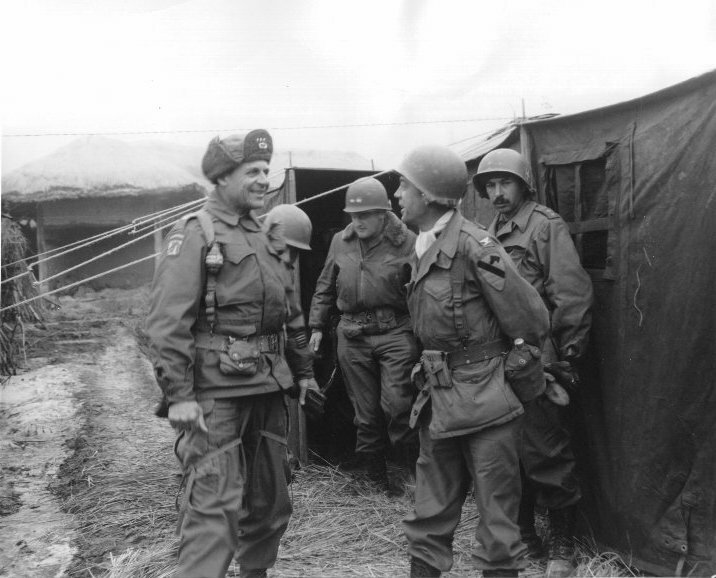 The news media had dubbed them pearl handled, which infuriated Patton. He used many colorful words in correcting them. "They're ivory! Only a pimp from a cheap New Orleans whore house would carry a pearl-handled revolver." This line's from the Patton movie and I'm not sure about its authenticity...but I loved it! If it isn't true, it aught to be,,, I know he gave one pistol away to someone, the other is in his collection. The George Patton museum is still located on Ft. Knox, but the Armor museum has been moved to Ft. Benning Ga.
Last edited by tankgeezer; 05-20-2012 at 11:11 PM.